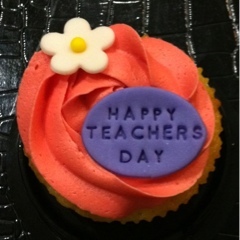 A special occasion every year, where we pay tribute to the amazing individuals in a remarkable profession. Would I have become a teacher? I often wonder. It surprised many I meet and I'm sure more will be surprised in future that I actually have an Honours degree in Geography. Apart from being totally passionate about baking & planning for HP's laserjet business, my other true passion is Geography *grin* Otherwise how do you study a subject for 10 years at school and still love it? Sincere thanks to teachers at St. Joseph's Institution Junior, Marymount Kindergarten and Confucius Institute for teaching my 3 boys. This year I made cupcakes for these amazing individuals who happen to be all ladies, so I settled on a Pretty in Pink theme. 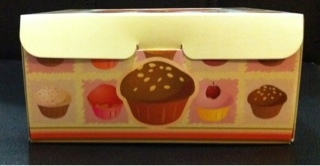 Very adorable box for 4 cupcakes. Pretty in Pink cupcake up close and personal. View of the box from the top and front. 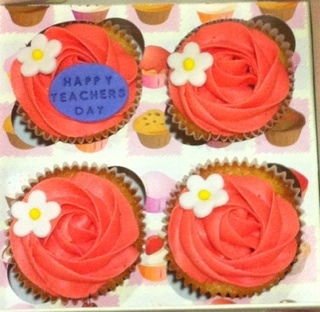 An old friend ordered some Pretty in Pink cupcakes plus some of another Teacher's Day theme - Resort Holiday. 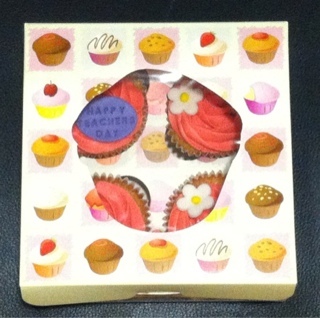 After completing the cupcakes, I felt like flying to a nice beach resort for a short getaway! Red Velvet - the new fad or new fab?